To Cite: Humayun Fard H, Hosseini S A, Azarbayjani M A, Nikbakht M . The Effect of Interval Training with Selenium Consumption on Gene Expression of Caspase- 3 and Cyclin-D in Liver Tissue of Cadmium-Exposed Rats, Jundishapur J Health Sci. Online ahead of Print ; 11(2):e88598. doi: 10.5812/jjhs.88598. Background: Cadmium is one of the heaviest metals in the natural environment that can increase DNA damage in liver cells, nevertheless, it has been reported that physical activity and nutrition can improve the damage of DNA in liver cells. Objectives: The aim of the present research was to review the effect of interval training and selenium on cyclin-D and caspase-3 gene expression in liver tissue of cadmium-exposed rats. Methods: In the present experimental research, 30 rats were divided to six groups of (1) control, (2) sham, (3) cadmium, (4) selenium consumption with cadmium, (5) interval training with cadmium consumption, and (6) interval training with selenium and cadmium consumption. For eight weeks, groups three to six received 2 mg/kg of cadmium per day; groups four and six consumed 0.23 mg/kg of selenium per day and groups five and six performed three sessions of selected interval training per week. Results: Cadmium consumption significantly increased cyclin-D and caspase-3 (P = 0.001); selenium consumption and interval training had a significant effect on decreasing caspase-3 and cyclin-D levels (P = 0.001); concurrent interval training with selenium consumption had interactive effects on the increase of cyclin-D (P = 0.001). However, there was no interactive effect on the reduction of caspase-3 (P = 0.75). Conclusions: It seems that interval training with selenium consumption has interactive effects on hepatocyte apoptotic factors in rats exposed to cadmium. Cadmium is one of the heaviest metals in the natural environment that is used by many factories. Increasing the concentration of cadmium in liver cells can increase the damage of DNA in these cells (1). Also, cadmium can increase caspases-3, 8, and 9, and increase the level of mRNA for caspases-3 and 8, as well as Bax, which in turn increases the amount of apoptosis in cells. On the other hand, cyclin-D is one of the most frequent genes in tumors (2). Based on previous studies, it has been shown that increasing the amount of mir202 reduces the expression of the cyclin-D gene, and stops cell division and induction of apoptosis (3). Micronutrient selenium is a part of antioxidant cysto-proteins. Selenium with its own effect reduces the production of free radicals and restores hydroperoxide mediums (4). In fact, selenium, by boosting the antioxidant defense system, accelerates recovery and reduces inflammation (5). It has also been shown that in selenium-receiving rats, the anti-oxidant glutathione peroxidase capacity increased as compared to the control group; and in the selenium-receiving group with training, as compared to rats in the training group, a significant decrease in malondialdehyde and a significant increase in the total antioxidant capacity and glutathione were found (4). Sports activities with different intensities have been reported to have different effects on the apoptotic process. For example, in one study, it was found that high intensity exercise could increase the gene expression of PGC-1α, which in turn increased the biogenesis of mitochondria, and since mitochondria plays an important role in apoptosis, it can decrease cellular degradation (6). A study conducted with an over-training protocol showed that caspase-3 liver tissue was less in the down hill training group compared to the control group, and although over-training protocol reduced stressors, it had no correlation with apoptosis in mice. Contrary to these findings, it has been reported that in rats with cardiac infarction, six weeks of high intensity interval training is more effective than low intensity interval training in increasing caspase-3 (which includes caspases for the production of caspase-3) (7). Regarding the contradictions in the findings of the reported studies and the effects of selenium on the reduction of the production of free radicals and inflammation, as well as the strengthening effect of selenium on the antioxidant defense system, the present study sought to investigate the interactive effects of interval training with selenium consumption on the gene expression of caspase-3 and cyclin-D in the liver tissue of rats exposed to cadmium. The present research was an experimental study. In this study, 30 male Sprague Dawley rats with an approximate age of eight weeks were purchased from the Islamic Azad University of Marvdasht and transferred to the Sport Physiology Laboratory of this university. Animals were kept in a standard situation (temperature of 23 ± 2°C; light/dark cycle of 12:12, and humidity of 45% to 55%). During the research period, standard food plate and water was provided freely. After seven days, rats were divided to six groups of five rats including: (1) cadmium, (2) selenium with cadmium, (3) interval training with cadmium, (4) interval training with selenium and cadmium, (5) sham, and (6) control. For eight weeks, rats in groups one to four received 2 mg/kg of cadmium peritoneally per day (8). It should be noted that during the eight weeks, the control group did not receive selenium, training, and cadmium, and the sham group received normal saline peritoneally. Rats in groups two and four consumed 0.23 mg/kg of selenium daily (9). As in a previous study, the safety dose of cadmium and selenium for rats was reported (8, 9); in the present study, 2 mg/kg of cadmium consumption and 0.23 mg/kg of selenium consumption was prescribed. Also, groups three and four performed selected interval trainings for eight weeks; three sessions per week. In order to perform interval training, the maximum oxygen consumption (VO2max) of all rats was measured by Bedford et al.’s standard test (10). The interval training included a combination of high intensity and low intensity interval repeats. High intensity interval repeat included two minutes with maximum intensity of 80% in the first week, 90% maximum in the second week, 100% maximum in the third week and 110% maximum speed from the beginning of the fourth week until the end of the training, and low intensity interval repeat (recoveryinterval) included two minutes with a maximum intensity of 50%. After performing the last high intensity interval repeat, the rats were allowed to cool down for five minutes at 60% to 60% intensity. The number of high-intensity interval repeats was determined according to the weekly training period of rats so that in the first week, two repeats of high-intensity interval; in the second week, four repeats of high intensity interval; in the third week, six repeats of high intensity interval; and since the beginning of the fourth week, eight repeats of high intensity interval were included. SPSS software, Kolmogorov-Smirnov, Two-way ANOVA, and One-way ANOVA with Tukey’s post hoc tests were used for analyzing the research findings (P ≤ 0.05). In Figures 1 and 2, the expression levels of caspase-3 and cyclin- D in liver tissue of rats are reported in six groups of the study. The results in Table 1 show that there was a significant difference between the gene expression levels of caspase-3 (P = 0.001) and cyclin-D (P = 0.001) in liver tissue of rats in the control group, sham, and cadmium. The results showed there was no significant difference in caspase-3 (P = 0.90) and cyclin-D (P = 0.29) gene expression in liver tissue of rats in the control and sham groups. However, the level of gene expression of caspase-3 in liver tissue of rats in cadmium consumption group was significantly higher than sham (P = 0.001) and control (P = 0.001) groups. Also, the level of gene expression of cyclin-D in the liver tissue of rats in the cadmium consumption group was significantly lower than the sham (P = 0.001) and control (P = 0.001) groups (Table 2). aSignificant difference at P ≤ 0.05.
aSignificant difference at P ≤0.05. The results showed that selenium (P = 0.001) and interval training (P = 0.001) significantly reduced caspase-3 gene expression in the cadmium-exposed rats. However, interactive effects of interval training and selenium consumption were not significant (P = 0.75). 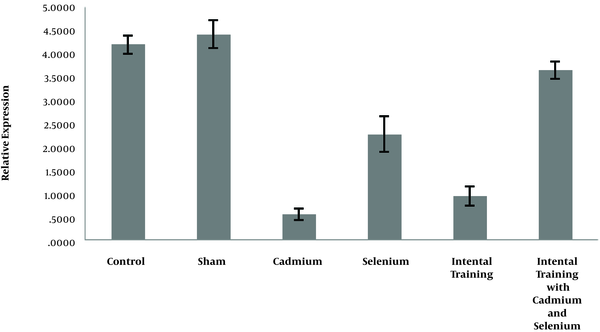 Also, selenium (P = 0.001) and interval training (P = 0.001) significantly increased the cyclin-D gene expression of cadmium-exposed rats, and the interactive effects of interval training and selenium consumption is significant (P = 0.001) (Table 3). The results of this study showed that in the cadmium consumption group, caspase-3 was significantly higher and cyclin-D was lower than the control group, which shows that cadmium consumption has a significant effect on increase of caspase-3 and reduction of cyclin-D in liver tissue of rats. However, there were no significant differences in the gene expression levels of caspase-3 and cyclin-D of control and sham groups, which shows that in present study cadmium solvent (normal saline) had no effect on caspase-3 and cyclin-D and all changes in caspase-3 and cyclin-D were due to cadmium consumption. Cadmium can cause cell damage and apoptosis in various organs of the body, including the liver, kidneys and the heart (11), which conforms to results of this research. Also, cadmium as one of the heavy metals and environmental pollutants contributes to the induction of the Fas/Fals signal pathway and plays an important role in increasing caspase-3 (12), which is consistent with the results of this study. Also, a study reported that cadmium in the nano-molar range could increase cyclin-D and cell proliferation of the anterior pituitary tissue (13), which is not consistent with the results of this study. Also, the results of this study showed that interval training has a significant effect on the reduction of caspase-3 and increased cyclin-D in rats exposed to cadmium. Seven weeks of swimming training resulted in decreased activity of caspase-3, as well as apoptotic agents Bax and cytochrome C, and increased Bcl2 in rats (14). In this regard, it was reported that the Bax gene expression and the Bax ratio to Bcl2, which is a factor in the production of caspase-3, was reduced in the rats that ran twelve weeks on treadmill, compared to the control group, which did not exercise (15). Physical activity increased cell proliferation and differentiation, as well as expression of cyclin-D in neuronal cells in rats with cerebral infarction, which is consistent with the results of this study. The results of this study showed that selenium consumption has a significant effect on the reduction of caspase-3 and increase of cyclin-D in rats exposed to cadmium. The effects of selenium as an antioxidant have been investigated in various studies and it has been reported that it can reduce cellular degradation factors, including caspase-3 and Bax (16). According to the results of this study, selenium consumption has a significant effect on the reduction of the gene expression of caspase-3 in rats exposed to cadmium. By investigating the effect of cadmium and selenium on cells, the interaction between these two in the cell can be found. The use of selenium simultaneously with the use of cadmium, due to its antioxidant properties, reduces cadmium toxicity (including reduction of caspase-3 and increased expression of PI3K/AKT/Bcl2); thus, it reduces apoptosis and preserves cellular life (17), which is consistent with the results of this research. Concerning the interactive effects, the results of this study showed that interval training combined with selenium consumption has interactive effects on the increase of cyclin-D in rats exposed to cadmium, however, there is no interactive effect on the reduction of caspase-3. Even though in different studies, the effects of training or selenium have been investigated separately on the gene expression of caspase-3 and cyclin-D in human and other animals, including cadmium-exposed rats, no study was found to explicitly indicate the interactive effect of interval training along with selenium consumption on the level of caspase 3 and cyclin-D in rats exposed to cadmium, so that the results could be compared with the present study; therefore, in order to fully understand the interactive effects of exercise training and selenium consumption on caspase-3 and cyclin-D in cadmium-exposed rats, more studies are needed in this regard. According to the findings of the present research, it seems that interval training and selenium consumption alone leads to improvement of caspase-3 and cyclin-D in liver tissue of rats exposed to cadmium. Also, interval training with selenium consumption has interactive effects on the improvement of hepatocyte apoptosis in rats exposed to cadmium. Considering the fact that the present study is a part of the doctoral dissertation approved by Shoushtar Islamic Azad University, the authors of this article express their gratitude and appreciation for the spiritual support of the Research and Technology Department of this university. Authors' Contribution: All authors equally contributed to writing and revision of this paper. Ethical Approval: Researchers received introduction letters from Sport Sciences Research Institute of Iran with ethics code IR.SSRI.REC.1397.38. Funding/Support: Islamic Azad University Shoushtar Branch. 1. Skipper A, Sims JN, Yedjou CG, Tchounwou PB. Cadmium chloride induces DNA damage and apoptosis of human liver carcinoma cells via oxidative stress. Int J Environ Res Public Health. 2016;13(1). doi: 10.3390/ijerph13010088. [PubMed: 26729151]. [PubMed Central: PMC4730479]. 2. Kaabinejadian S, Fouladdel S, Ramezani M, Azizi E. Molecular analysis of Bcl-2 and cyclinD1 expression in differentially expressing estrogen receptor breast cancer MCF7, T47D and MDAMB- 468 cell lines treated with adriamycin. Daru J Pharmaceutical Sci. 2008;16(3):183-8. 3. Jiang J, Huang J, Wang XR, Quan YH. MicroRNA-202 induces cell cycle arrest and apoptosis in lung cancer cells through targeting cyclin D1. Eur Rev Med Pharmacol Sci. 2016;20(11):2278-84. [PubMed: 27338052]. 4. Zolfeghar Didani H, Zolfeghar Didani M, AsriRezai S, GhaderiPakdel F. Effect of short term nano selenium supplementation and exhausted training in oxidation indices on heart tissue of male rats. Sport Physiol. 2017;9(35):49-62. 5. Zheng D, Zhao Y, Sun X, Liu L, Xia Y, Sun L, et al. Supplemenation of selenium attenuates cisplatin induced podocyte injury via BCL-2/BAX/caspase-3 pathway. Int J Clin Exp Pathol. 2017;10(4):4058-68. 6. Hadidi V, Kordi M, Gaeini A, Hadidi V, Shafie A, Hajatimodaraie M. Effect of eight weeks high intensity interval training on gene expression of PGC-1α, in male healthy rats fast-slow twitch muscles. Sport Biosci J. 2015;35:49-62. 7. Gahramani M, Azarbayjani MA, Peeri M, Raoufi A. Interval training intensity and the expression of caspase-9 in obese rats with myocardial infarction. Iran J Diabetes Obes. 2016;8(3). 8. Rahimi Kazerouni M, Mokhtari M, Shariati M, RahimiKazerouni S. The effect of Oliveriadecumbens aqueous extract on functional factors and tissue changes in adult male rats under cadmium chloride poisoning. J Physiol Evolution. 2015;29(2):42-33. 9. Dzobo K, Naik YS. Effect of selenium on cadmium-induced oxidative stress and esterase activity in rat organs. South African J Sci. 2013;109(5/6):1-8. doi: 10.1590/sajs.2013/965. 10. Bedford TG, Tipton CM, Wilson NC, Oppliger RA, Gisolfi CV. Maximum oxygen consumption of rats and its changes with various experimental procedures. J Appl Physiol Respir Environ Exerc Physiol. 1979;47(6):1278-83. doi: 10.1152/jappl.1979.47.6.1278. [PubMed: 536299]. 11. Naderi S, Zare H, Taghavinia N, Irajizad A, Aghaei M, Panjehpour M. Cadmium telluride quantum dots induce apoptosis in human breast cancer cell lines. Toxicol Ind Health. 2018;34(5):339-52. doi: 10.1177/0748233718763517. [PubMed: 29591890]. 12. Yuan Y, Zhang Y, Zhao S, Chen J, Yang J, Wang T, et al. Cadmium-induced apoptosis in neuronal cells is mediated by Fas/FasL-mediated mitochondrial apoptotic signaling pathway. Sci Rep. 2018;8(1):8837. doi: 10.1038/s41598-018-27106-9. [PubMed: 29891925]. [PubMed Central: PMC5995901]. 13. Ronchetti SA, Miler EA, Duvilanski BH, Cabilla JP. Cadmium mimics estrogen-driven cell proliferation and prolactin secretion from anterior pituitary cells. PLoS One. 2013;8(11). e81101. doi: 10.1371/journal.pone.0081101. [PubMed: 24236210]. [PubMed Central: PMC3827476]. 14. Qin L, Yao ZQ, Chang Q, Zhao YL, Liu NN, Zhu XS, et al. Swimming attenuates inflammation, oxidative stress, and apoptosis in a rat model of dextran sulfate sodium-induced chronic colitis. Oncotarget. 2017;8(5):7391-404. doi: 10.18632/oncotarget.14080. [PubMed: 28030847]. [PubMed Central: PMC5352330]. 15. Jafari A, Pourrazi H, Nikookheslat S, Baradaran B. Effect of exercise training on Bcl-2 and bax gene expression in the rat heart. Gene Cell Tissue. 2015;2(4). doi: 10.17795/gct-32833. 16. Ren H, Mu J, Ma J, Gong J, Li J, Wang J, et al. Selenium inhibits homocysteine-induced endothelial dysfunction and apoptosis via activation of AKT. Cell Physiol Biochem. 2016;38(3):871-82. doi: 10.1159/000443041. [PubMed: 26909517]. 17. Bao RK, Zheng SF, Wang XY. Selenium protects against cadmium-induced kidney apoptosis in chickens by activating the PI3K/AKT/Bcl-2 signaling pathway. Environ Sci Pollut Res Int. 2017;24(25):20342-53. doi: 10.1007/s11356-017-9422-6. [PubMed: 28707237].